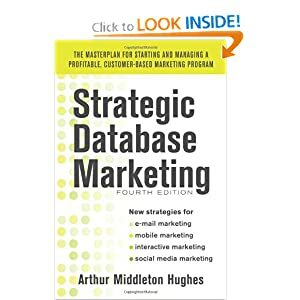 Database marketing got its start in the early 1980s when techniques started by mass mailers such as American Express and State Farm Insurance used their customer lists to build ongoing relationships with their customers leading to increased retention and cross sales. The roots of database marketing go back to a period in the United States before there were supermarkets. Back in those days, all the groceries in the US were sold in small corner grocery stores. The proprietors knew their customersÍ names. They would stand at the door and greet customers by name as they entered, asking them about their families and their concerns. They put things aside for customers, helped them to carry heavy packages out to their cars, building strong and lasting relationships. They built their businesses by developing and cultivating the loyalty of their customers. These fellows are all gone today. They were forced out of business by the supermarkets. Mass marketing took over, along with mass production. Prices came down. Quality, quantity and variety went up. The average corner grocer had 800 SKUs in his store. The average supermarket today has more than 30,000 SKUs. The change affected the way Americans lived. In 1950 the average American family was spending 31% of their household budget on food. Today the average family is spending only 14% on food, and the food they are getting is better in quantity and quality than what they were spending 31% on fifty years ago. Because of the lowered cost of food, families have much more money to spend on hundreds of other products that were out of the question fifty years ago. So we have all gained. At the same time, we as suppliers have all lost. We have thousands, hundreds of thousands, or millions of customers. We donÍt know them, and they donÍt know us. Loyalty has gone out of the window. If you talk to an employee in a supermarket, you are interrupting them from their regular work, which is certainly not standing by the entrance and chatting with the customers. You are loyal to that supermarket until tomorrowÍs newspaper when a coupon from somewhere else leads you to drive to another store. Database marketing has enabled merchants to begin to bring back some of the intimacy that prevailed in the pre-supermarket days. The software and hardware became increasingly sophisticated and their prices have been in a free fall for years. As a result it is now possible to keep, economically, in a computer the kind of information on customers that the old corner grocer used to keep in his head and to use that to build lasting profitable relationships with customers. While many companies are using this information to collect lots of data about customers and their transactions, there are still many who have failed to make profitable use of it. There is one principle that has remained true throughout the period since 1985. Database marketing only works in building customer loyalty and repeat sales if the customer benefits from it. The customer has to think, ñIÍm glad that IÍm on that database becauseƒî with the supplier filling in a meaningful end to the sentence. If the database does not touch the customerÍs life in some way that is satisfying to her, then she will ignore the communications, leave her Gold card behind when she shops, and refuse to become loyal. 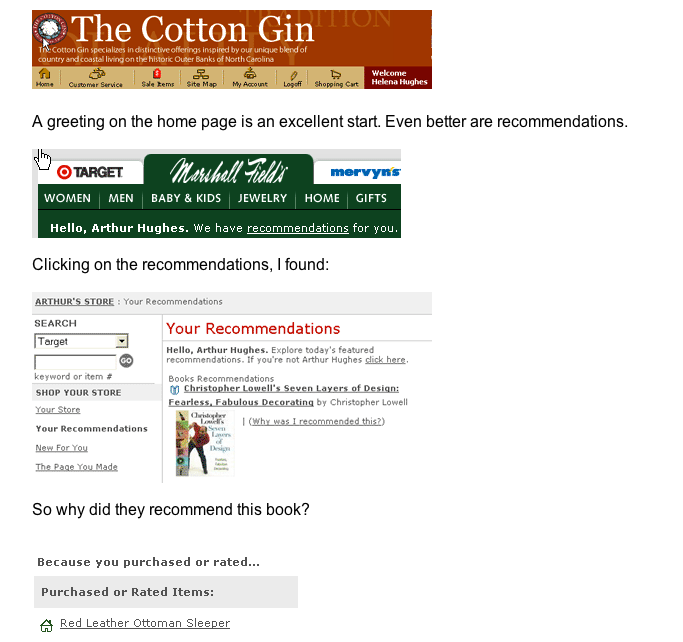 Too many retailers and catalogers have ignored that principle and, as a result, failed to succeed in database marketing. How do you touch a customerÍs life using a database? There are many ways, some of them so simple that we overlook them. When I fly into San Francisco, check into a Hyatt Hotel and push the button for Room Service, they respond, ñYes, Mr. Hughes. What can I get you to eat?î I have been in this hotel less than twenty minutes, yet already, down in the kitchen, they know and use my name. This is possible because Hyatt, and most hotels today, have Caller ID on their internal hotel telephone system. When you push that button in your room, the Caller ID goes to the database that Hyatt created when you checked in, to pull up the information, ñArthur Hughes, Room 1202î on the screen so that Room Service can call you by name. This is database marketing. It is what the old corner grocers used to do, now possible by modern technology used in a creative way. You are 2,000 miles from home, yet they know you and recognize you. It makes you feel great! Caller ID, of course, is not just for hotels. Catalogers throughout America are using it to recognize customers when they make repeat calls. Using this technique, before a call is answered, the database is brought up showing the customerÍs complete purchase history, demographics and preferences on the customer service repÍs screen, so she can respond, ñMrs. Webster. So nice to hear from you again. How did your granddaughter like that sweater you gave her last October? Caller ID lets catalogers do what the old corner grocer used to do. How much does it cost for a cataloger’s customer service to be able to say this in response to an incoming call? About one penny per incoming call, if you have a customer database. What is it worth to a cataloger to be able to say this? Tests can be used to show the increased lifetime value. There is no question that this kind of customer service can result in increases in retention and cross sales of a magnitude that makes the costs seem insignificant. I bought the red leather Ottoman Sleeper for Helena for her birthday. How did they come to this (quite accurate) conclusion about my book preference? Because the Marshall Field website uses collaborative filtering — software that lets them predict what customers want to buy, based not just on what they have already bought but on what thousands of other Marshall Field’s customers with similar tastes have bought. Home and garden cataloger Smith & Hawken used Net Perceptions collaborative filtering software to boost its online sales performance and give its online customers more personalized service. In a three month head-to-head the company compared online shopping transactions that offered up-sell and cross-sell product recommendations generated by Net Perceptions Inc.Ís analytic software versus those that did not. The Net Perceptions software-driven product recommendations resulted in orders that were on average 16.5% larger; they also increased the number of items in each order by an average of 60%. The technology underlying this type of software for cross-selling and up-selling uses both ruled-based and analytically driven personalization, a combination not widely used yet among catalogers. Rules based recommendations say, “If she bought a dress, offer her matching shoes or a belt”. Analytics-based recommendations determine what customers might buy next based on what the database knows about a customer and her similarity to other customers in the database. This type of software produces unusual combinations like the Marshall Field recommendations of a book based on the purchase of an ottoman. 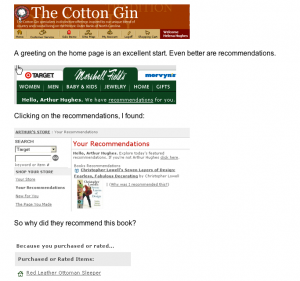 So there are dozens of ways that catalogers today can boost sales using caller, ID, cookies and web personalization.